"Mypods And Boomsticks"/"Straight As An Arrow"/"Phantom Telethon"
This fall's Sunday night schedule has been a bit wonky, with random weeks-off cropping up here-and-there. (There were no episodes last week due to Fox's 24 movie/extended preview for the new season.) And it looks like, after tonight, there's only one more week until our beloved AnDom takes an extended rerun break well into the new year–actually, no one told Family Guy, which is already done for '08–so it's time to make those episodes count. 1) How much do you think Apple had to pay for this kind of exposure? 2) Why change the name of the company if you're not going to change Microsoft or Old Navy, which were also referenced? Strange contract negotation? 3) Isn't this show known for capturing the zeitgeist of, oh, today, and not a few years ago? Speaking of…on top of Lisa's acquisition of a MyPod, followed by a massive MyTunes Music Store purchase and trip to Steve Mob's underwater Mlair, the rest of the crew welcomes a Muslim boy to the neighborhood. But, get this, people totally suspect his family is made up of terrorists. And by people, I mean Homer, swayed by Lenny and Carl and a serendipitous episode of 24. But he's totally right, because just look at the conversations he (hilariously) over-mishears: The dad enjoys blowing up buildings…for his job! And Homer has a dream in which the genie from Aladdin turns "American" music into Cat Stevens! Ha ha? I could forgive the timeliness thing if the episode had come, say, last year; due to longer lead times for animated shows, it's not like The Simpsons can turn around an Obama special the night after election day or anything. But if there are still jokes to mine from Apples ubiquitousness or America's intolerance of Muslims post 9/11…well, there's exactly one–and it comes as a banner a the end of the episode that reads "Sorry for my intolerance," one Homer uses a lot apparently. But the rest of the episode was quite tired. King Of The Hill seems to have fallen back on old jokes as well: The Simpsons's jokes. There's a new family in town, and the dad Wesley (Ned Flanders) wants to start up a chapter of a Boy Scouts type thing for his overprotected sugar-starved sons (Rod and Todd). At first, Hank is thrilled–he was a whatchamajigger when he was a boy, and he wants to pass on the valuable lessons and bruises to Bobby. But his attitude changes once he sees Wesley's curriculum, one that favors plastic knives and fake campfires in libraries over outdoorsy stuff and the mistakes of youth. Come to think of it, the whole family's a group of homeschooled, family bed–sleeping, tag–banning know-it-alls, and Hank wants to teach them a lesson in fun. So when Wesley leaves the library campsite, Hank and friends bring in cupcakes and let the boys run around outside. Normally, Hank Hill finds himself at odds with those more liberal than he is, and tension arises when their beliefs threaten his comfortable way of life. The threat's still apparent here, but he's instead dealing with those even more conservative than himself, which is a nice change of pace. And it makes for a pretty satisfying conclusion to the episode: Wesley is furious that Hank thinks he knows how best to raise the Rod and Todd stand-ins, when, in fact, one's got ADHD and the other is hypoglycemic. Wesley is overprotective for a good reason, and Hank was truly wrong to enforce his beliefs on other people's kids. 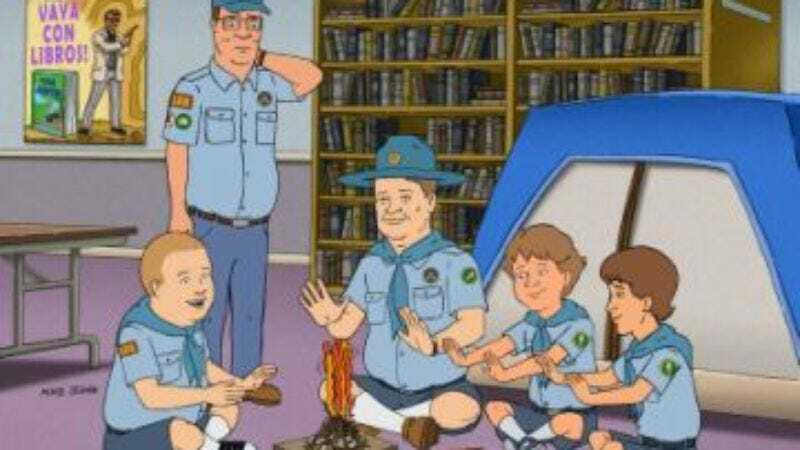 Some, like Bobby, wanna know how to build a real fire, so not all was lost. Similarly, this episode wasn't all that bad, it just could have benefited from some tightening–like losing the entire LuAnn storyline. On the flip side, I wanted more from tonight's American Dad. The last few episodes have been quite good, demonstrating the show's ability to use its gags to service a larger story. But this one, centered around a CIA telethon to raise money for torture, was almost nothing but gags. It all starts when Stan steals Roger's telethon idea, forcing Roger to haunt the set, a la Phantom Of The Opera, with ominous organ music (from a small keyboard) and menacing pranks. For one, he releases a terrorist, who rigs the set with explosives and refuses to give up the diffusing password. If only Stan could torture him–but then, the phones ring off the hook, the CIA gets its waterboarding and Stan saves the day. That's as much plot as we get, and the rest is mostly filler. Two agents recreating the slo-mo volleyball scene from Top Gun? Good. Roger dressing Steve up as the opera's captured maiden? Not so much. Stan trying to invent things ("Hamburger…hinderer)? Heh. The terrorist's retort to Stan's refusal to negotiate with him: "You've bought a mattress before, haven't you?" Meh. A show only as good as its gags? Maybe Family Guy didn't take a week off after all. - I love that Wesley's the kind of guy who blindly maces people he sees in his driveway. So much for the plan, Dale.